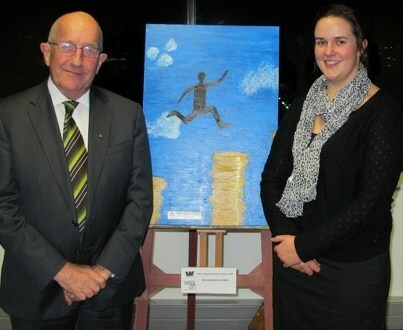 The finalists' artworks are on display at Hamilton East, Hillcrest and Cambridge branches of Westpac until the end of August 2012. 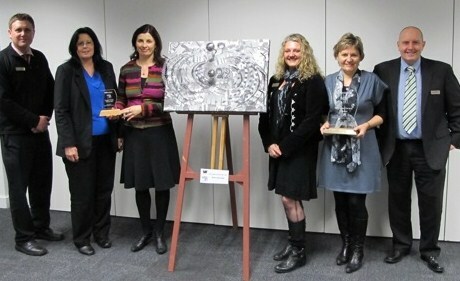 The Westpac/WSA (Waikato Society of Arts) Business Art Award for 2012 was won this week by law firm McCaw Lewis Limited. The winning trophy was presented by Grant Robson, Area Manager Hamilton, Business Waikato, Westpac. A trophy, new for this year, a People’s Choice was awarded also to McCaw Lewis Limited, by Geoff Hampton, Manager of Westpac, Hamilton East. The three finalists were exhibited in the Hamilton Westpac for two weeks prior to the award and customers were free to vote on their choice. The winning entry was a team effort and was based on the open air sculpture presented by McCaw Lewis to Hamilton City in 1987 that now hangs on the riverbank below the Waikato Museum. The canvas had a background incorporating overlaid photographic images taken by their team of public art in Hamilton with a three dimensional multi-media model of “The Ripple” superimposed. The McCaw Lewis team explained how they decided on their subject and how the various staff members contributed to their work. 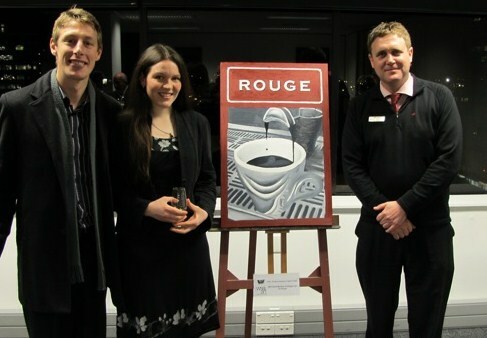 For McCaw Lewis the Westpac/WSA Business Art award was obviously a great staff team building exercise.